Ah, the theme. Love it or hate it, it seems the Instagram theme is here to stay. My main problem with themes is not so much that they exist, but that so many of them are so similar. We all like light and bright photos, but the white theme with touches of blush pink and grey is so overdone. What will Instagram become if we all start to conform to this one bland colour scheme? I get the temptation to imitate people who are successful, and to tailor what you’re doing to what people seem to like. But to me, the interesting accounts are the colourful ones, the quirky ones, and the ones with lots going on. This is a toughie, because as everyone who blogs will tell you, it isn’t all about the numbers. But on the other hand, we can look at our own photos on our camera roll – we wouldn’t be posting them if we didn’t want other people to see them. Growing a following on Instagram, in my eyes is bloody impossible. It doesn’t seem to matter how much I engage with other people, how often or when I post, how much I plan out my feed or try to improve my photos – nothing. This leads to me swinging between working really hard on it, and not posting for days. We all have that one person on our feed with dark, out of focus photos of rubbish looking dinners, and somehow they have 3,000 followers. And then there’s the blogger you love who has a brilliant feed full of amazing photography, and they have 500 followers. Instagram doesn’t seem to ‘reward’ the right people at all, and it’s really frustrating to see great accounts going unnoticed. You wake up to notifications saying ten people have followed you. ‘Great!’ you think, ‘I must have hit my milestone!’ But you check your following, and you have five fewer followers than you did before! We all know about the bots people use to mass follow people in the hope they will follow them back, before unfollowing them straight away. There’s been lots of attention around ‘fake followings’ recently, but I don’t see this changing any time soon. Now on to the good points. I’m lucky that there are some lovely people over on Instagram who like and comment on my photos on a regular basis. People I’ve met at events, got chatting to over Twitter or who just like my photos. As frustrating as the following struggle is, I’m grateful to be part of an active little community and to connect with other people through the medium of highly staged, marble-laden photos. As I mentioned, I’ve never personally been a big believer in themes, but there’s no denying it’s a very satisfying feeling when your feed just looks good. It’s sad really, but when you see your last nine looking aesthetically pleasing and your photos balanced, it makes you feel a little warm inside. 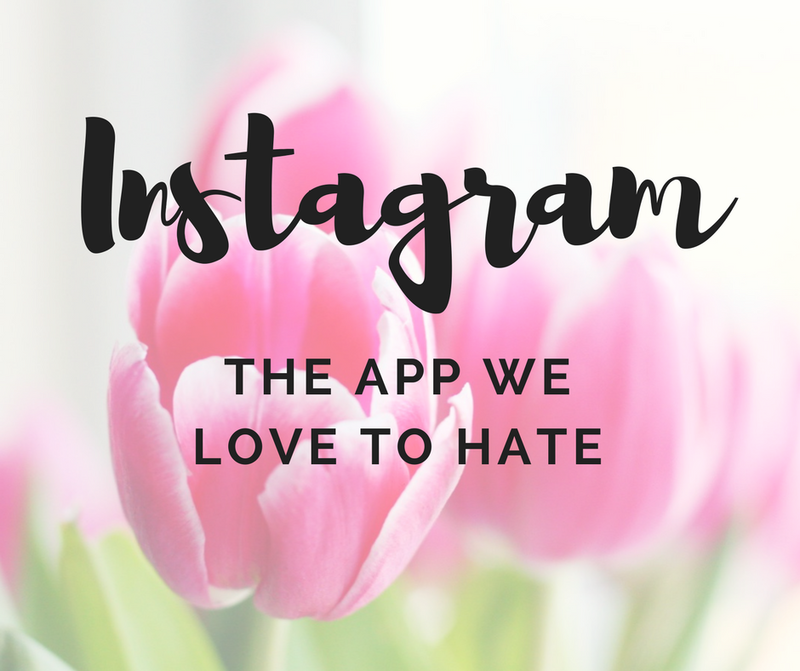 What do you love to hate about Instagram? I love and hate Instagram for the exact same reasons! I know there is nothing that we can do about it but FB killed it when they introduced the algorithm. I know algorithms can be useful but as you say all the wrong people get rewarded. I’m pretty convinced it’s because they eventually want people to pay for it. I still use Instagram mostly for work but I still like chatting to people etc but keep who I’m following down to a manageable level or you just can’t keep up with posts. I have to say the thing that bugs me the most about Insta is how they co-opted the best of other apps like snapchat and periscope but it’s also so handy to have it all in one place and not have to cross post, so I feel a bit hypocritical using it but I end up using it out of habit. Anyway sorry for the ramble! Oh I love this! What I can’t stand on Insta are the looka-like themes. For example, so many mommy blogger accounts look…the same. Same filters, poses, even homes and interior decorations…I’ve stopped following some of them because at times I get confused and don’t even know whose account I’m looking at until I see the username! Ugh. Be original, people! Trends are boring. Pretty much for the same reasons..
Don’t get me wrong I love accounts that look pretty just because they are visually but I enjoy accounts that are quirky and show that persons life. Accounts where the images aren’t all ‘posed’ for. I don’t have many Ig followers and I’ve had it for ages and apart of me feels it is because my account doesn’t have a theme. It is forever frustrating to have people following you yet your followers go down every single day. Quite surprised that instagram hasn’t really put more of a stop to it! I totally agree with everything you said, particularly the problem with themes. I can’t stand the white, marble and rose gold “theme” – and it’s every-bloody-where. For a while it was like my feed had been soaked in bleach – so boring! I feel the pain – and like you I have a few weeks where I’m constantly on Instagram and then weeks where I get unbelievably frustrated with it. Last week, I steered clear completely.